An international team of astronomers has reported the single largest haul of planets discovered and confirmed using NASA's Kepler spacecraft on its K2 mission. Among the 104 confirmed planets is the first planetary system comprising four potentially Earth-like planets. 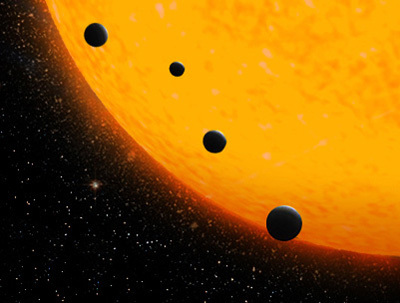 The researchers achieved this extraordinary roundup of exoplanets by combining Kepler's data with follow-up observations by ground-based telescopes, including the Automated Planet Finder (APF) at UC's Lick Observatory, the twin Gemini telescopes in Hawaii and Chile, the W. M. Keck Observatory in Hawaii, and the Large Binocular Telescope (LBT) operated by the University of Arizona. The plentiful bounty of newly discovered exoplanets demonstrates the potential for similarly successful observations in support of future missions such as NASA's Transiting Exoplanet Survey Satellite (TESS) and the James Webb Space Telescope (JWST). The discoveries are reported in a paper to be published in Astrophysical Journal Letters and currently available online. Kepler's initial mission focused on measuring the frequency with which planets whose size and temperature are similar to Earth occur around stars like our sun. K2 looks at new types of populations, including a larger fraction of cooler, smaller, red dwarf-type stars, which are much more common in our Milky Way than sun-like stars. "Because Kepler's mission required it to observe only a small patch of sky, it was designed to conduct a demographic survey of the different types of planets. The K2 mission allows us to increase the number of small, red stars by a factor of 20, significantly increasing the number of astronomical 'movie stars' that make the best systems for further study," said Ian Crossfield, a Sagan Fellow at the University of Arizona's Lunar and Planetary Laboratory, who led the research effort. Crossfield will be joining the astronomy department at UC Santa Cruz in August. Andrew Skemer, assistant professor of astronomy and astrophysics at UCSC, is a coauthor of the paper. One of the most interesting sets of planets discovered in this study is a system of four potentially rocky planets orbiting a star less than half the size of (and much fainter than) the sun. The planets, all between 20 and 50 percent larger than Earth by diameter, are orbiting the M dwarf star K2-72, found 181 light years away in the direction of the Aquarius constellation. Their orbital periods range from five and a half to 24 days, and two of them may experience irradiation levels from their star comparable to those on Earth. Despite their tight orbits—closer than Mercury's orbit around the sun—the possibility that life could arise on a planet around such a star cannot be ruled out, according to Crossfield. After the Kepler space telescope had revealed more than 4,000 candidate exoplanets and many confirmed and validated planets during its initial four-year survey, NASA decided to modify its mission after two of the spacecraft's reaction wheels, which help maintain its precise orientation in space, malfunctioned. Under the K2 mission, the telescope no longer stares at one small patch of sky to detect as many planets as possible, but instead scans a much larger portion of the universe while traveling around the sun. 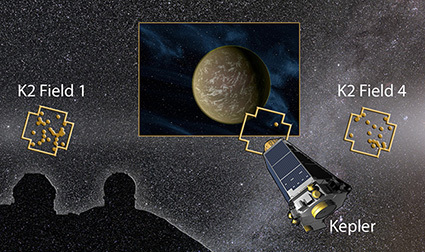 Like the initial Kepler mission, K2 discovers new planets by measuring the subtle dip in a star's brightness caused by a planet passing in front of its star. To validate candidate planets identified by K2, the researchers obtained high-acuity images of the planet-hosting stars from Keck, Gemini, and LBT (among others), as well as high-resolution optical spectroscopy using Keck and the APF. By dispersing the starlight as through a prism, the spectrographs allowed the researchers to infer the physical properties of the star—such as its mass, radius, and temperature—and of any planets orbiting it. According to Crossfield, these observations represent a natural stepping stone from Kepler to NASA's other upcoming exoplanet missions such as TESS and JWST. "Our analysis shows that by the end of the K2 mission, we expect to double or triple the number of relatively small planets orbiting nearby, bright stars," Crossfield said. "And because these planets orbit brighter stars, we'll be able to more easily study everything possible about them, whether it's measuring their masses with Doppler spectroscopy—already underway at Keck and APF—or measuring their atmospheric makeup with the James Webb Space Telescope in just a few years." For a full list of authors and funding information, see the research paper, "197 Candidates and 104 Validated Planets in K2's First Five Fields."